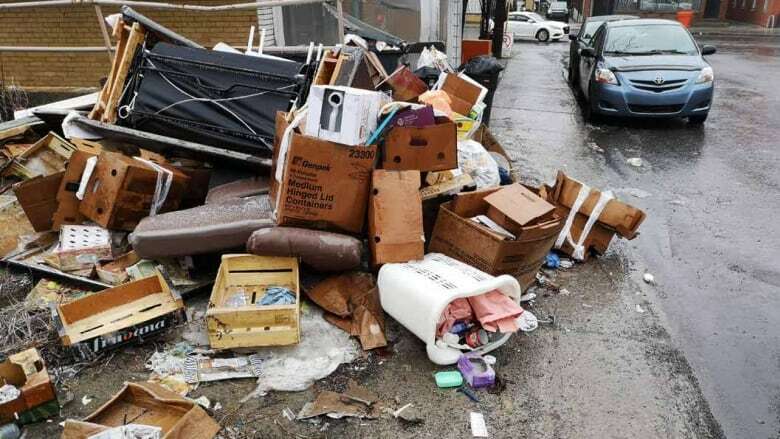 Residents and councillors in Montreal's Ahuntsic-Cartierville borough are raising a stink about mountains of garbage scattered around the neighbourhood. Now the borough council has a plan to address the problem. 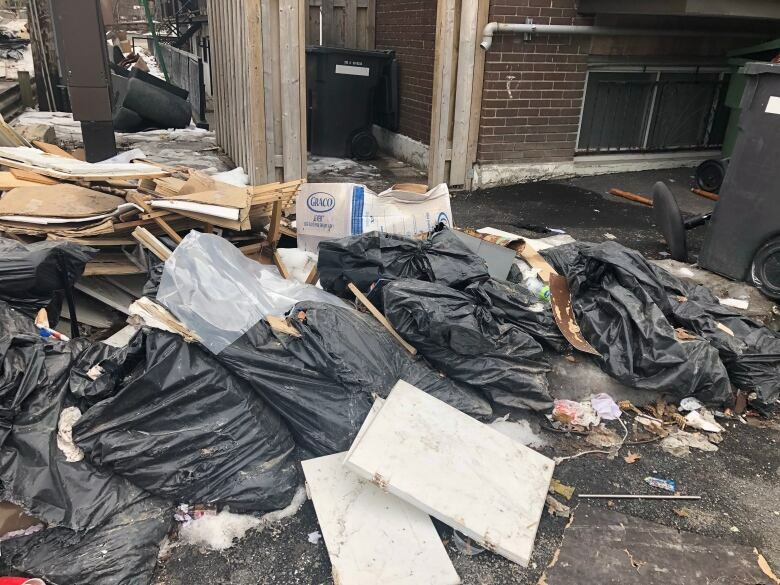 Residents and councillors in Montreal's Ahuntsic-Cartierville borough are raising a stink about garbage piling up uncollected and left to rot on sidewalks, in alleys and on the edges of parking lots. 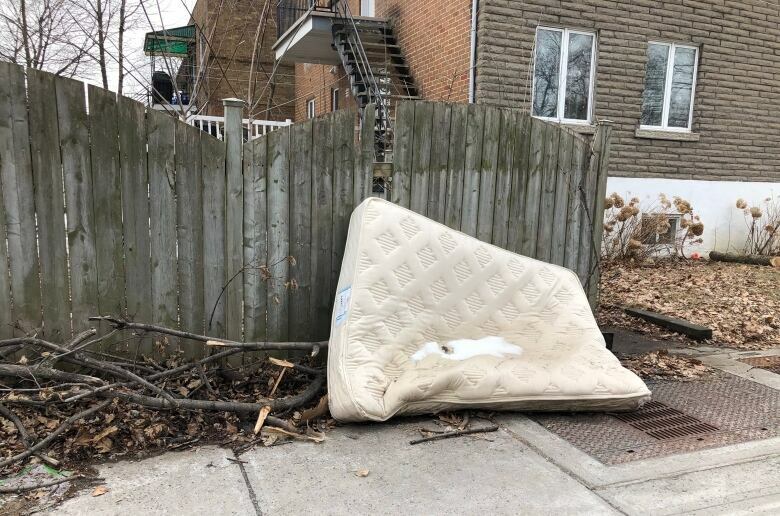 "I've been seeing a lot of big pieces lying around — like mattresses, pieces of furniture, garbage bags, boxes," said Rosetta Lafratta, who lives on Gouin Boulevard West. "I would like the city to pick up all the junk, all the garbage that's lying around for, like, several weeks and clean up the place. We pay taxes and we want our city to be clean." Lafratta is far from the only one who is angry. Residents crammed into the borough council chambers on Monday evening to register their disgust. The melting snow has made the problem even more apparent, and the city should be doing more to mitigate the situation, says Ensemble Montréal Coun. Effie Giannou, who represents the district of Bordeaux-Cartierville. "I see what everybody else sees," she told CBC Montreal's Daybreak Friday. The borough council has tabled a cleanliness plan that includes an investment of at least $500,000 to manage the mess, said Giannou. "We want our neighbourhood to be beautiful," she said. To do that, the borough plans to bring in more inspectors to check on businesses, parking lots and private properties to ensure people are disposing of their trash properly and on scheduled days. Garbage left on the street too early — or too late — is a major concern, she said. "There are four days during the week where there is a specific type of garbage that's collected," she said. "So let's say, for example, on Thursday you put out a mattress because you decide you don't want that mattress anymore. Well, the day of collection was the day before." That means, she elaborated, the mattress will be out in the elements, under rain and snow, for a week and "it's disgusting." Right now, all garbage pickup in the borough is contracted out. Giannou said Ahuntsic-Cartierville will also be acquiring its own garbage truck to do additional cleanup. Council is expected to approve the cleanliness plan at its next meeting, she said, as it is not a question of partisan politics — the garbage problem is one that all elected officials in the borough want to solve quickly. "There's a need for more and more education, whether it is something as basic as scheduling," she said, noting she'll be going door-to-door this weekend to tell residents about the borough's waste collection service. Not all streets are a problem, she said, but there are parts of the borough that clearly need help. "There's an added element of education that needs to be done," she said and she is encouraging borough staff to help her get the word out — sending out the information over and over again to ensure every new resident gets the message and long-time residents don't forget.